The Brane Skip device may provide a way for humanity to overcome the light-speed barrier and finally head for the stars. It seems like magic to Lisa Chang, the young engineer in command of the first crewed test flight, and Lisa doesn’t believe in magic. But she does believe in the mission. Humanity must explore space in order to survive and prosper, and she feels honored to be among the first to go where no one has gone before. She does not know what will happen when the Brane Skip engages. She thinks it will do nothing. She fears it will explode. She does not expect it will cast them adrift in space and on a collision course with a fantasy version of Earth, complete with dragons, orcs, and wizards. Unfortunately, this is exactly what happens. Brane Child is Dungeons and Dragons meets Star Trek. 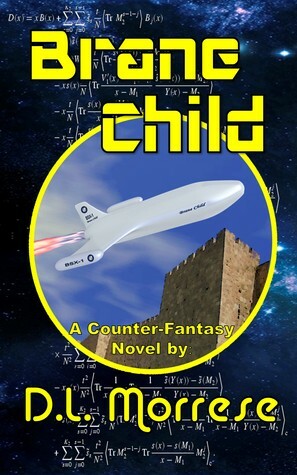 It’s tongue-in-cheek fun that any fan of science fiction or fantasy would love. Numerous aspects from some favorite/popular TV shows and books make-up a big part of the story. The novel is like watching an old episode from a beloved TV show. You know how it’s going to end but you like the journey and seeing familiar faces and places. This book even had a mention of Schrodinger’s cat, which Big Bang Theory fans will recognize. As soon as I read this paragraph I knew exactly what would happen when the BS device was engaged. The same thing happened in an episode of Star Trek: The Next Generation. I did find it a little annoying that the characters didn’t figure it out until the end but that was just a small part of the story. Another frustrating piece was how Sandra was objectified: “Her effortless magnetism drew the eyes of several men in the dining hall as she and her companion made a visual survey of the room.” Even in the future men still can’t control themselves. And all she was doing was walking through a room and she is made to feel uncomfortable. After they activate the BS device and jump they find themselves looking at a planet that looks strangely like Earth. As they try to land flying dragons start to attack the ship. Unfortunately, this is the only time the dragons make an appearance. They come across a castle with humans fighting Orcs. Our confused antagonists land, squishing a few Orcs but mostly scaring the beasts away. During the landing it is discovered that the BS device is damaged and to fix it they need some palladium to recreate the broken piece. Of course, their sensors don’t detect anything too far from the castle so they have to rely on the castle inhabitants. The Brane Child crew makes a deal with the King: they will get rid of the Orcs who are being led by an evil mastermind and as payment they will get enough palladium to repair the Brane Skip device. From there until the end it is fun watching the crew learn about the new world and fight creatures with magic they don’t actually believe in.